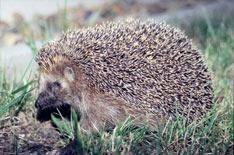 Roadkill statistics raise hedgehog fears | What Car? Analysing roadkill statistics may seem an unlikely method of monitoring wildlife, but that's exactly the reason concerns are growing for the hedgehog population of Britain. The Peoples Trust for Endangered Species has issued a warning for the health of Britian's hedgehog population, following the revelation that it accounted for only 16.1% of last year's roadkill a fall of 7.5% since 2001. Researchers fear that the lower death toll indicates a smaller overall population, especially as hedgehogs are particularly prone to being run over by cars because they only react to an oncoming car when it is an average of eight metres away. In contrast, a rabbit will react when a car is an average of 161 metres away. 'The short reaction distances mean that running is unlikely to be any more effective as an escape response than freezing and, because hedgehogs are taller when they run than when they crouch, they are more likely to be struck by a vehicle's undercarriage if fleeing,' said David Wembridge of the People's Trust for Endangered Species. Despite this, rabbits still account for the majority of roadkill, due to the greater number of them in the wild.